With a publication date of tomorrow (May 10), there is a new French AIC coming out “15/18: OVERFLIGHT OF CONFLICT ZONES“. Of note is the new addition to the list – Saudi Arabia. 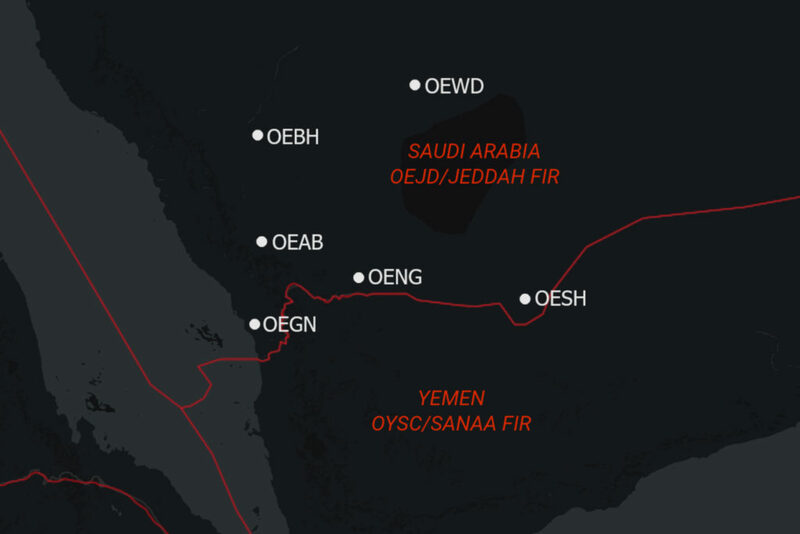 – Not to operate any flights to OEAB/Abha, OEGN/Jazan, OENG/Nejran, OESH/Sharurah, OEWD/Wadi Al Dawasir and OEBH/Bisha airports located in the southwest of the FIR – these airports should not be planned as alternates either. The advice here is similar to the existing German Notam issued back in March, which warns against flying close to the border with Yemen, and to avoid landing at OEAB/Abha airport. The German Notam also makes a point of referencing the risk of operating to both OEJN/Jeddah and OERK/Riyadh, due to the high number of missile attacks launched against these airports from within Yemen recently. With the overall increase in missile activity in the southwest of the country, there is now a clear risk to operations in Saudi airspace, even outside the SCATANA area. The conflict between Saudi Arabia and Yemen remains complex and volatile. Safeairspace continues to provide up-to-date information for both Saudi and Yemen airspace.